Los Angeles has always been a city of possibilities and reinvention. A youthful and independent spirit permeates the culture and gives a sense of freedom found in few other places. This environment provided fertile ground for the growth of a lesbian, gay, bisexual, and transgender (LGBT) community that had a major influence on LGBT life in the United States. For most of American history, queer identities were only visible in forms of entertainment, with most of the culture existing underground and in fear. By the 1950s, however, a few brave gay people living in Los Angeles dared to challenge society's negative views on homosexuality. For the next two decades, L.A. produced the nation's first LGBT leaders, organizations, and publications, and gave birth to the national movement for LGBT equality. This book is produced by Roots of Equality, a grassroots LGBT organization founded by Kersu Dalal, Tom De Simone, Justin Emerick, Melissa Lopez, Andrew Sacher, Diem Tran, and Teresa Wang. 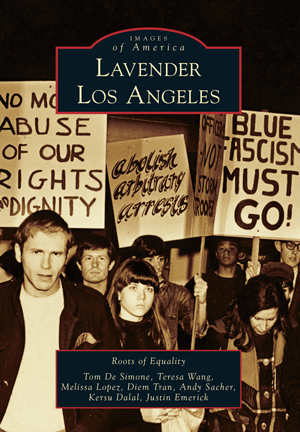 In 2009, Roots of Equality produced Lavender Los Angeles as an exhibit, which uncovered many little-known histories of the LGBT community in Los Angeles. This book is based on the exhibit, and most of the images come from ONE National Gay and Lesbian Archives.